Happy Summer Solstice!!! aaand Happy Strawberry Sagittarius Full Moon! The first yoga routine I ever posted was actually this time last year...instead though, it was in honour of the first International Yoga Day, which is actually tomorrow. 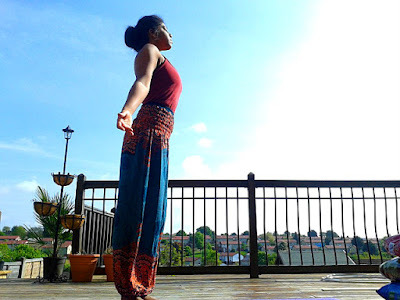 It was the Sun Salutation A yoga sequence, so I thought in honour of that, we can thank the Sun and welcome the summer together, with this Sun Salutation B or Surya Namaskar B yoga sequence! 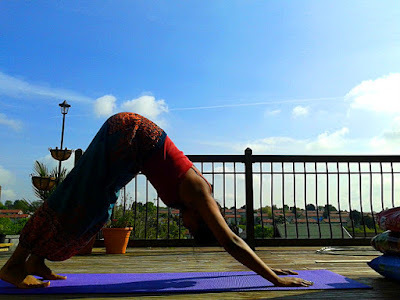 If you're new to the sun salutation, it may be a good idea to practise Variation A first before picking up the pace with the additional poses included in this variation. When doing the poses, breathe from your abdomen and ensure that you go at you own pace and to your own ability (you'll see later on I had help from a pile of compost bags for my headstand), don't worry about what you think yoga poses are 'supposed' to look like or about getting a pose 'perfect', that's not what yoga is about. Yoga is about letting go and finding and doing what feels good! 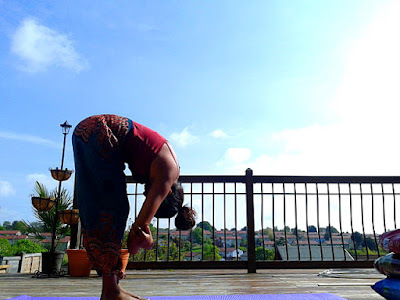 Inhale, bending your knees trying to get them as nearly parallel to the floor as your can, they will project out over the feet and raise your arms perpendicular to the floor, palms facing each other. Your front torso should form more or less a right angle with the tops of your thighs. Keep your shoulder blades drawn down and the lower back long. Inhale as your lift half way, pressing your fingertips either into the floor or your hands into your shins or upper thighs, whichever is comfortable so long as your back is flat. Keep your neck long. Keep your knees slightly bent. Exhale as you bring your hands back down and jump your feet back into a plank pose, shift your weight forward a little then hug your elbows into your sides and slowly lower down. Make sure your hands are in line with your shoulders and come onto the tops of your feet. Exhale as you slowly lower back down to the floor. ...and exhale as you push back, lifting your hips. 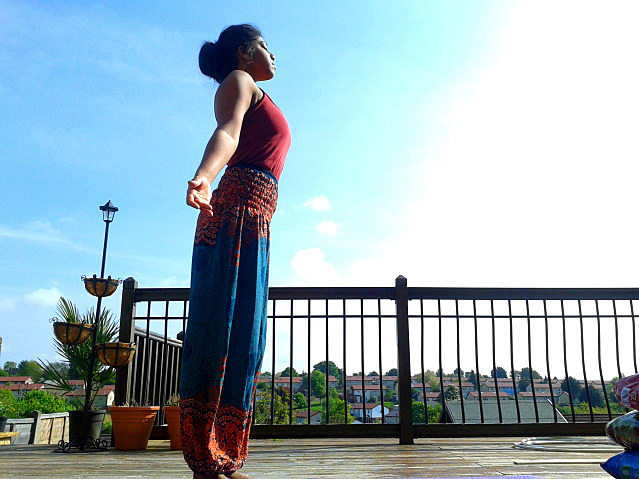 Spread your fingers, lift your sit bones toward the sky and move your shoulder blades away from your ears. Press into your palms and the soles of your feet, your heels don't need to touch the ground. If your wrists feel strained, press into the area between your index finger and thumb. 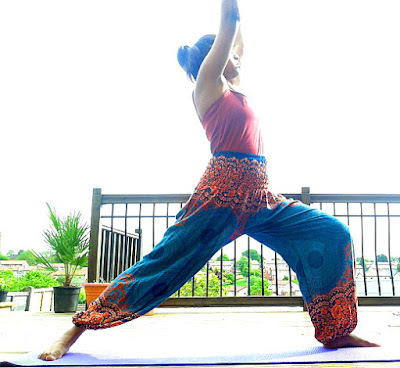 Step your left leg forward on an inhale, turning your right foot toward the from right hand corner of the mat. 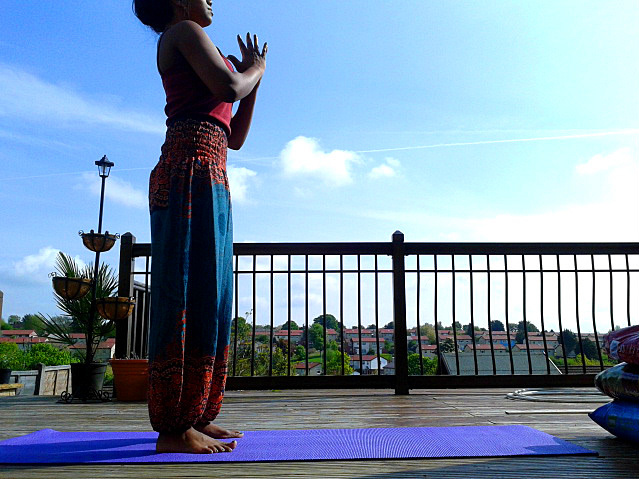 Relax the shoulders and draw the shoulder blades down and lift your arms overhead, palms facing towards each other. Press into the outer edge of your back foot and keep your legs strong. Exhale to bring your arms back down and stepping your right foot back into a plank before slowly lowering down. 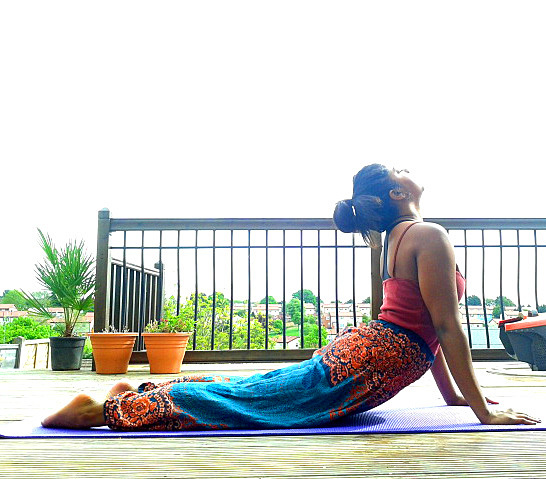 ...and exhale as you push back, lifting your hips into a Downward Dog Pose. Step your right leg forward on an inhale, turning your left foot toward the from left hand corner of the mat. Relax the shoulders and draw the shoulder blades down and lift your arms overhead, palms facing towards each other. Press into the outer edge of your back foot and keep your legs strong. 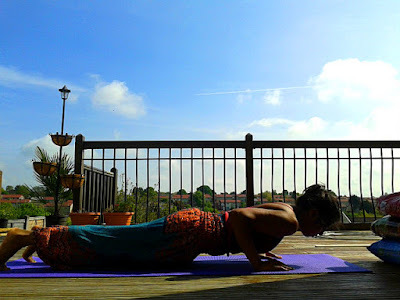 Exhale to bring your arms back down and stepping your left foot back into a plank before slowly lowering down. ...and exhale as you push back, lifting your hips into another Downward Dog Pose. Stay here for about five breaths. 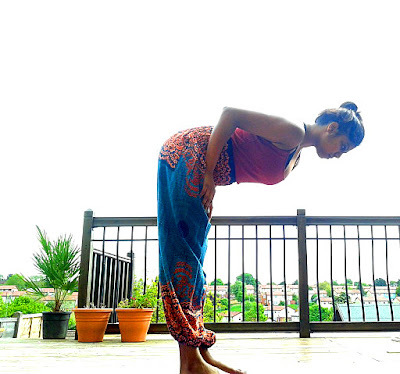 Inhale as you step your feet up to meet your hands and lift into your Flat Back Pose. 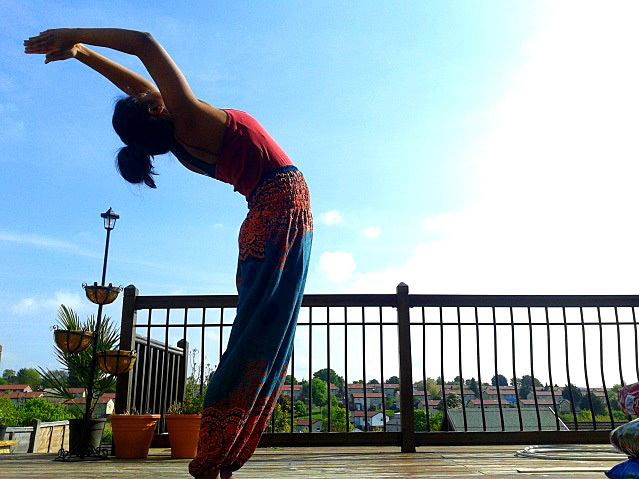 Exhale back down into a Forward Fold. 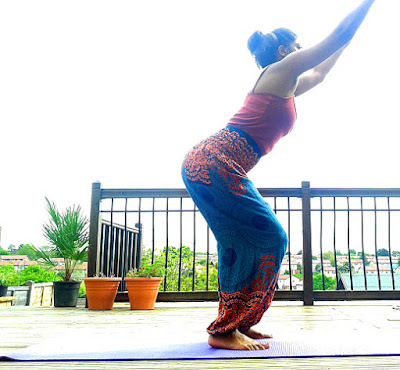 Inhale as you raise your arms and bend your knees into another Chair Pose. 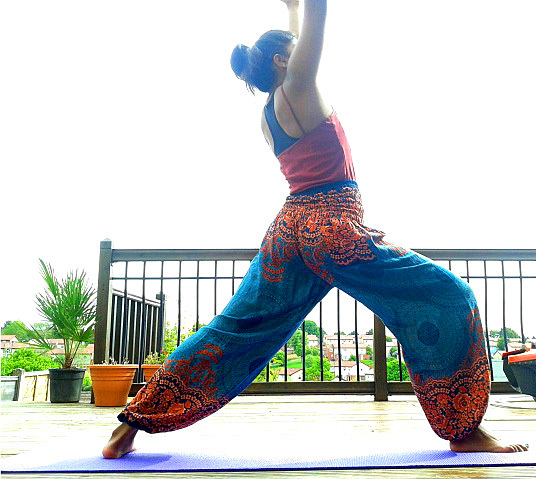 Exhale, straightening your legs into Mountain Pose, with your hands in prayer position at the heart.